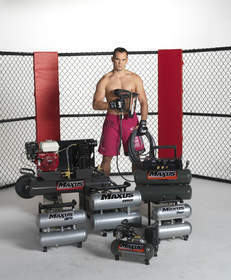 CINCINNATI, OH--(Marketwire - December 1, 2008) - Maxus, the contractor air compressor and power tool expert, launches www.MaxusSupportsRich.com, the main event for exclusive American Fighter Rich Franklin updates as he battles Dan Henderson in the light heavyweight match at UFC® 93. In addition to getting the latest news regarding Rich, visitors can enter the Countdown to the Fight sweepstakes for the latest Maxus tools. "Maxus is proud to sponsor Rich Franklin," said Eric Tinnemeyer, VP of sales and marketing for Maxus. "His strength, dedication to hard work, and drive to win personify the Maxus brand." Grand Prize: A Day with Rich and Maxus. A one-day, two-night stay in Cincinnati, that includes a training session and lunch with Rich, Maxus facility visit and a Maxus EX2001 air compressor, Maxus finish nailer and an American Fighter Fan Pack. 2nd Prize: Maxus EX2001 air compressor, Maxus finish nailer and an American Fighter Fan Pack. 3rd Prize: Maxus EX2001 air compressor and an American Fighter Fan Pack. Fans of the Month: Three winners selected in December and January receive a Maxus brad nailer and an American Fighter Fan Pack. The Maxus family of contractor and commercial powered equipment includes a full line of compressors, pneumatics, nailers, welders, pressure washers and abrasive blasters. Maxus products are available at STAFDA locations and tool catalogs such as Grainger. For more information, contact 1-888-MAXUS4U (1-888-629-8748) or visit www.maxustools.com. Rich Franklin and Maxus tools team up.